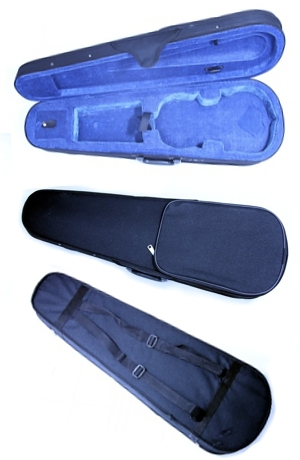 Light-weight violin case - all sizes. Easy to carry with little gravity and less impact, should the case be accidentally dropped, compared to a heavier case. From August 2014, Designed in Italy will offer plywood based violin cases that will have a longer life span, compared with the light-weight cases but plywood cases will be heavier and they have a higher price tag. Available sizes: 1/32, 1/16, 1/8, 1/4, 1/2, 3/4, 4/4. AFTER clicking 'Add to cart,' please adjust the quantity to match the total number of ordered light-weight violin cases.